* ways in which employment services ought to work for people with AS. Preface to the Series. Genevieve Edmonds. Introduction. Luke Beardon 1. 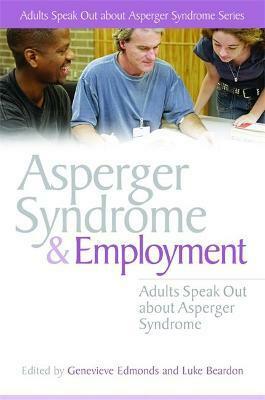 Employment for People with Asperger Syndrome: What's Needed? Giles Harvey. 2. The Job Needs to Work for the Worker. PJ Hughes. 3. Experiences of Employment and Stress Before My Diagnosis of Asperger Syndrome. Alexandra Brown. 4. `How Do You Communicate that You Have a Communication Problem...When You Have a Communication Problem?' Asperger Syndrome and Employment. Neil Shepherd. 5. Case Study by an Employee with Asperger Syndrome and His Line Manager. Dean Worton and Paul Binks. 6. The World of Work (Is Not Another Planet) and My Journey to Get There. Dr John Biddulph. 7. Finding, Applying For and Starting a Job. Mark Haggarty. 8. What I Have Learned from 25 Years of Employment. Steve Jarvis. 9. Asperger Syndrome and Employment: My Experiences and Observations. Anne Henderson. 10. What Aspies Need to Know When Working in the Neurotypical Environment. Cornish. 11. A Melmacian in the Workplace: Asperger Syndrome for Employers. Chris Mitchell. 12. Surviving the Workplace: Asperger Syndrome at Work. Stuart Vallantine. 13. The Importance of Motivation and Clear Communication at Work. Vicky Bliss. 14. Continuing to Search for the Rights Job for Me. Philip Bricher. 15. I'm Just So Willing to Work. Emma Beard. List of Contributors. Index. Chris Mitchell was diagnosed with Asperger's Syndrome in 1998, when he was 20 years old. Having completed an MA (Hons) in Information and Library Management, he currently works at Durham County Council. He is an active advocate for raising awareness of the positive aspects of AS, giving talks, seminars and workshops throughout the UK. He also offers mentoring and support services for school leavers and students entering higher education with AS. Chris has written an autobiography of his own experience of AS, entitled Glass Half-Empty, Glass Half-Full: How Asperger's Syndrome Has Changed My Life and practices meditation in his spare time.